In the form of aluminum cans, American consumers sell more scrap aluminum to recycling centers and scrap yards than any other type of metal. In fact, according to the Can Manufacturers Institute, Americans are earning about $1 billion each year just from recycling aluminum cans. If you want to get a piece of the pie, here are some tips that will help you sell scrap aluminum. Step One: Find a good place to sell your scrap aluminum. Mid City Scrap Iron & Salvage in Westport is family owned and operated and has served residents, businesses and industry in the greater Cape Cod area since the 1930s. They offer top prices for scrap aluminum and will buy all sorts of ferrous and non-ferrous scrap metal. If you want to know where to recycle aluminum cans on the Cape, check out Mid City. Give them a call locally at 508-675-7831 or use the toll free number 1-800-334-4789 to check scrap metal pricing, office hours and directions. Step Two: Learn how to identify other forms of aluminum. Aluminum cans are the top recycled item, but aluminum is also found in other products and is just as valuable. For example, some household appliances are made with aluminum. Instead of just throwing your items out on the curb, you can learn how to retrieve these scrap metal parts and sell them as well. Step Three: Start saving and collecting aluminum cans. There are lots of ways to save and collect cans to sell. One is to get in the habit of rinsing, crushing and saving the cans you use in your own home. Another is to collect cans when you are out and about in the neighborhood. Chances are you won’t even have to dig around in trash cans, as people tend to drop them frequently in parks and other public places. Carry a plastic bag with you when you go for a walk or take the kids to the playground. Step Four: Check with local laws about “scrapping” from curb items. Technically, when someone puts something out on the curb it’s considered “fair game” and anyone can take it. However, some cities are passing laws preventing pickers and scrappers from taking discarded curb items or grabbing cans from trash cans. If it’s legal – go for it. If it’s not – don’t mess with it. Step Five: Learn how to separate aluminum from other metals and materials. In some cases you will find aluminum that has iron bolts or brass ties attached to it. It will be worth more if you remove these items from your recovered aluminum when you sell it. Step Six: Use Craigslist.org or local newspaper ads to get more aluminum. One way around local restrictions is to advertise free local pick-up or removal of unwanted appliances. People often don’t know what to do with these items and you will be doing them a favor while getting your hands on some more scrap metal. Step Seven: Sell your scrap metal to Mid City Scrap Iron & Salvage. Bring in all of your collected scrap metal and sell it to Mid City. You will be paid according to the type and quality of the metal you collect according to the daily going rate. Your scrap metal will be sorted and weighed to get you the best price for aluminum on the Cape. Remember – scrap metal rates change depending on the market. You can always call Mid City in advance to find out the daily rate. Approximately 105,500 aluminum cans are recycled every minute across the country. In as few as 60 days, used aluminum cans can be recycled and back on a store shelf in the form of a new can. On average, more than 1 out of every 2 cans is recycled in America. Experts have estimated that over 25 million tons of aluminum has been recycled since 1972. Aluminum doesn’t begin to melt until it hits 1220-degrees Fahrenheit. 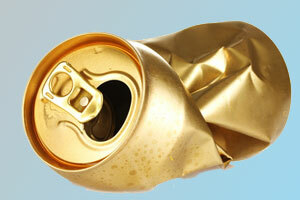 The average American family recycles approximately 150 six-packs of aluminum cans each year. Aluminum never ever ever wears out – it can be recycled and reused over and over again forever. You can make money from all of your scrap metal, so there’s no reason to stop at recycling and selling your aluminum cans and materials. There are lots of different types of metals that can be collected and sold in your home. Copper, stainless steel, iron and many other metals and alloys all have value. There’s no reason not to make the most out of every appliance, decorative piece or utility tool you don’t want or need anymore by selling it for scrap.